Nobody likes vacant storefronts. They deaden street life, send a message of neighborhood decline, and deprive the community of needed retail services. The challenge is finding the cure. Many cities have seized upon a vacancy tax. Taxing owners who “intentionally” keep storefronts vacant creates a financial incentive for them to seek tenants. Voters favor such taxes because they only impact offending property owners; 70% supported Oakland’s vacancy tax last November and a similar outcome is likely for a San Francisco measure planned for the November 2019 ballot. But vacancy taxes will not cure the crisis of storefront vacancies. And that assumes they are upheld by courts, which is questionable. I wrote about the legal challenges to vacancy taxes one year ago (“To Boost Retail, Build Housing”). I’ve regularly seen sound pro-tenant laws invalidated by zealously pro-property rights judges, and would not bet on courts upholding $250 daily fines (proposed by SF’s Peskin) when an owner has a “For Rent” sign on the window. But even if upheld the vacancy tax fails to help the vast majority of owners who want to fill storefronts but cannot get tenants. Everyone knows that there is a far, far bigger reason for vacant storefronts than uncooperative owners: it’s called online shopping. Online shopping has diverted billions of dollars away from purchases along commercial corridors, and these sales are not returning absent a fundamental change in the surrounding consumer base. 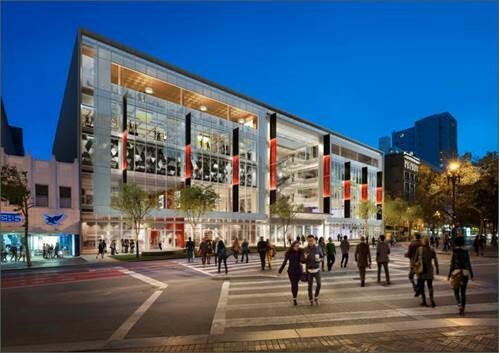 6 X 6, San Francisco’s new 250,000 square foot mall, still sits vacant in Mid-Market (see accompanying photo). We last wrote about its status in 2017 (“Mid-Market’s Empty Shopping Center“). Does anyone believe the owners of 6 X 6 want it to remain empty? Or that malls have closed across the United States because a huge wave of owners want to keep stores vacant? A vacancy tax will affect so few owners it will hardly be noticed. But many politicians are unwilling to enact the real cure for rising retail vacancies, which is increased housing density and height along commercial corridors. They prefer to keep storefronts vacant rather than alienate constituents who oppose apartments and/or increased density in their neighborhoods. We know the best strategy to fill vacant storefronts. But in San Francisco, Berkeley and other cities increasing heights and density is off the table, so empty storefronts remain. Today, any storefront business that is subject to online competition is at risk. Increasing foot traffic is the only way retail businesses can make up for customers shifting to online purchases. SF Examiner columnist Joel Engardio recently interviewed Vas Kiniris, a “retail doctor” who helps small businesses thrive. Kiniris is currently working with merchants in San Francisco’s West Portal neighborhood. Most tourists never see West Portal, which has physically changed little compared to the rest of San Francisco. Some merchants back more housing. Others feel that housing is not needed if West Portal could attract more cutting edge and creative businesses. But those businesses will not open on corridors with insufficient foot traffic. And if West Portal cannot support its retail businesses at current pedestrian levels, why would a new business move in? It won’t. And as Kiniris notes, new businesses need to see more foot traffic before making the increasingly expensive investment of opening a storefront. New housing brings this foot traffic. A vacancy tax alone does not. San Francisco’s rebuilt Hayes Valley shows the connection between increased housing density and retail success. Its shops and restaurants are filled mid-week because its density means a lot of people live nearby. True, Hayes Valley is a completely gentrified neighborhood but so is Aaron Peskin’s North Beach, a neighborhood whose vacant storefronts led the supervisor to begin talking about a vacancy tax in 2017. In Generation Priced Out: Who Gets to Live in the New Urban America I describe how “progressive” cities have created and maintain land use policies that price out a new generation of working and middle-class residents. These anti-housing, anti-density policies also endanger once thriving retail corridors. Cities are denying small businesses the foot traffic they need to survive. Politicians are allowing anti-housing constituents to keep storefronts vacant or subject to regular turnover. Cities have a choice: try to fill vacancies by simply punishing bad actors or expand housing and retail patronage by building more housing along commercial corridors. The latter is clearly the better option. But based on cities weak response to online shopping to date, it may take state action to bring the increased housing that many commercial corridors desperately need .